When Comfortiva asked us to feature their new fall line this season I knew I wanted to go back to the place where we first shot with them and where I posted my first bump update. They are a really wonderful company and have been my go-to shoe company since this brand uses a pillowtop memory foam footbed which not only makes their shoe line super comfortable but allows them to absorb shock which reduces impact and maintains proper foot support. Perfect for pregnancy! I’ll talk more about this in the post but being comfortable with yourself while navigating a growing a baby bump can be more of an effort than it sounds! To me being “in my comfort zone” is when I am able to stay grateful for my changing body without going down the negative rabbit hole of what I am not fond of (I.e., cellulite, breaking out, dry skin). I notice that when I put on my gratitude “rose-colored” glasses instead of my “negative Nancy” ones, I am better able to tackle my to-do list that includes everything from grocery shopping, taking Winter on an outing or attending a meeting downtown. With Comfortiva- I have these great sandals that take me from day to night seamlessly, making it one less thing I have to think about in my hectic life! I was 13 weeks along the last time we shot in this same location, bright-eyed, so full of hope and just really excited to be pregnant. I can't stop looking at those photos from that day and compare them to the ones that you see here in this blog post. My belly has grown quite a bit. I have grown quite a bit as a human being also and it's really neat to see where I came from and where I am now. Some major life changes happened since that first bump update. I decided to take a year off from my job as a school psychologist, launch a new business, The Mindful Mama's Club and focus on the blog full time. In a few short weeks we will be welcoming a new baby into our family. It's really come full circle. Thank you to each and every one of you who have been reading these updates since the beginning or are just joining us now. We are grateful to be sharing our experience of growing baby #2 with you! I plan to print this out and have in my birthing room! It makes me laugh and will also remind me how strong I am. I am 34 weeks. I now begin seeing my midwives every other week. 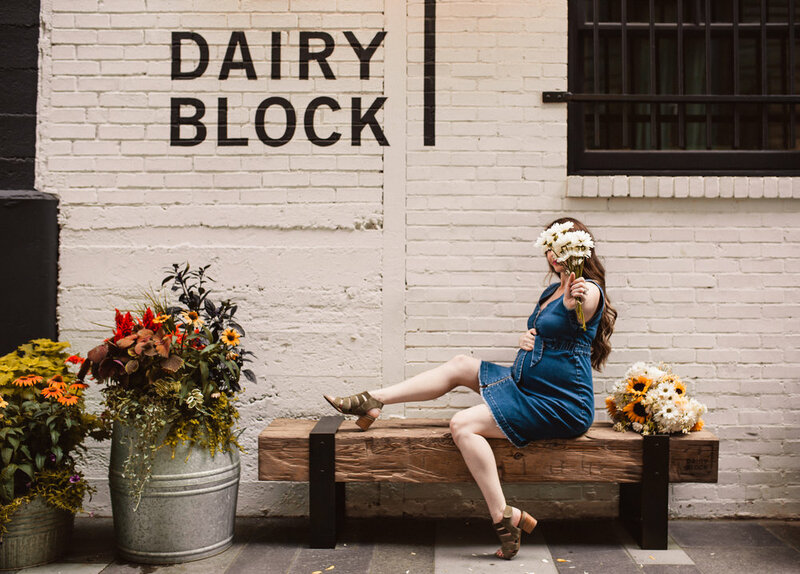 We also have a two-hour appointment scheduled when I am 36 weeks to go over my birth plan, paperwork and to make sure Perry and I feel as prepared as we can before attempting... no, accomplishing natural birth at a birthing center. We also met with our doula for the first time. I can't wait to share what that was like for us. It felt like it bonded Perry and I together even tighter and made us both feel so secure in our connection and ability to work as a team. Physically, I am worn down. I know I have been pushing my limits because a few days I had Braxton hicks and crazy ligament pain. I was able to stop the contractions with a nice warm bath with lavender oil in it, but it made me really evaluate just how much I have been doing. I am working on the art of slowing down, tuning in and connecting with my body and this baby. My biggest fear is that I will regret not spending more intentional time with this baby and I definitely don't want that to happen. Emotionally, I feel pretty grounded. I was nervous because I had to get my heart checked out (I have a history with a heart arrhythmia called Wolfe Parkinson White) and I was so worried that they would say that a birthing center wasn't the best option for me. Nerves most definitely got the best of me because I threw up before my appointment. Thankfully, I got cleared and I have been able to relax more. I am all for maternity dresses. This bump is too big to fit into most of my non-maternity clothes, even when I size up. A lot of my days are spent at home so you can also find me in nightgowns and an oversized shawl (when it's cold in the mornings). By the afternoon I usually have meetings or am shooting so I love to be able to dress up a bit with these sandals from Comfortiva but still get the support I need. I have worn Comfortiva since I got my first pair at 13 weeks and now own 6 pairs! I am totally that person that when I find a brand that I love, I collect all their products! The ones I am styling in this post are the Alexis, a stylish gladiator sandal featuring a polished block heel with an adjustable sling and elasticized straps to make it easy to slip them on and off. It’s the perfect transitional style to take you from Summer to Fall. I can't wait to show you more from their fall line as the weather gets colder, my bump gets bigger and then afterward when I am in the postpartum phase. I don't track my weight gain on a consistent basis (except for at the doctor's appointments) because in the past (when I was in my early twenties), I experienced unhealthy thoughts about the number I saw staring back at me. Since noticing that cycle of unhealthy thinking I have made a concerted effort to give my body grace and instead of picking it apart, I think about the qualities that I like. Cultivating self-love takes time and I believe it will be a journey that I am on for the rest of my life. I've noticed that with this pregnancy I have a lot more cellulite, I am carrying much bigger than I did with Winter and my skin feels extra dry. If I let myself go there I could easily pick myself a part. But I choose to NOT go there. And if for some reason I slip up and accidentally do, I redirect my attention to positive body image and make myself three things that I am grateful for regarding it. I have the greatest gift of growing a human and I have to be able to give myself some slack. I know I haven't been able to work out as much as I did with Winter and that's okay. Right now all that matters is that I am healthy, baby is healthy and the rest is just stuff. It's so touch and go. Some nights I am asleep for eight hours straight. Other nights I get up to pee at least three times or struggle with a bit of insomnia. I am pretty good about sticking to my night time calm down routine which consists of essential oils, stretching before bed and reading while wearing a weighted blanket on my legs. I also still nap at least once a week with Winter. Waking up next to her is probably my favorite thing in this whole world. So many things including getting to know my doula better, practicing the labor support positions with Perry, learning more about natural birth, and nesting. We don't have a designated space for the baby downstairs where Perry and I work nor in our room so I want to focus a bit of my energy on that. Also, I just pulled out a newborn box and cried my eyes out. I can't believe Winter was ever that tiny. Popsicles and crushed iced. My favorite thing is to take a bath with Winter and eat ice chips together. It's all those tiny micro-moments that I live for! This blog post was sponsored by Comfortiva. As always are thoughts and opinions are my own.